Consumer Cellular leverages AT&T and T-Mobile network technology to cover a purported 99% of its three million US customers. Consumer Cellular offers a wide array of phones, from the most basic of devices all the way up to current flagships. Interestingly enough, and considering its target demographic, there’s a decent selection at the upper end. A financing option called EasyPay allows customers the peace of mind in spreading device payments out over time. Rather than charging them hundreds of dollars at time of service, its subscribers can pay $25 per month with the phone bill. Do you already have a phone or possibly looking to buy an unlocked device for use on Consumer Cellular? If the equipment in question meets certain criteria (GSM unlocked, previously used on AT&T or T-Mobile you can get a free SIM card if you wish to bring your own device. Going all-in with its intended audience, Consumer Cellular powers an 8-inch 4G tablet designed for tech novice seniors 75 and over. The GrandPad features large, easy to read icons and includes admin tools for a family member/caregiver to monitor and assist. 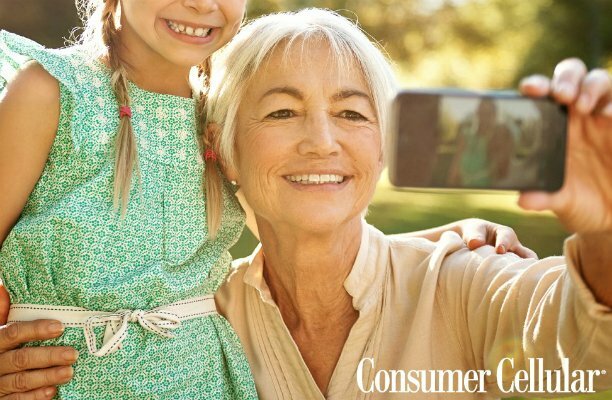 Consumer Cellular has a great deal for AARP members, giving them a 5% discount off of monthly fees and usage charges, a 30% discount off select accessories, plus an extended 45-day money back, risk-free guarantee. What’s more, new subscribers can sign-up for AARP membership during checkout after selecting service and devices.